I Love Creamy Iced Coffee. I HATE paying over $4 a glass for it at some fancy-schmancy coffee house! After literally years of trying, I have found it! 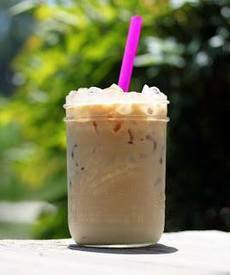 I have figured out how to make the perfect creamy & sweet Iced coffee for pennies a glass! I'm gonna show ya how! You have to make your coffee concentrate. Don't worry, the gallon of coffee concentrate you end up with will make enough to last you for a month in the fridge! You do NOT want to brew a normal pot of coffee for your iced coffee. You want to cold-brew it. This leaves you with a smooth, acid-free coffee base that we all love for a refreshing cold drink.